Never released in the classic Mego toy line of yesteryear! It's that violent vigilante - The Punisher! Comes in a vintage-style box with two additional heads and outfits. Designed and sculpted by EMCE Toys. Marvel's violent vigilante. Never released in the classic Mego toy line of yesteryear, The Punisher is the next Marvel character to get the retro action figure treatment. 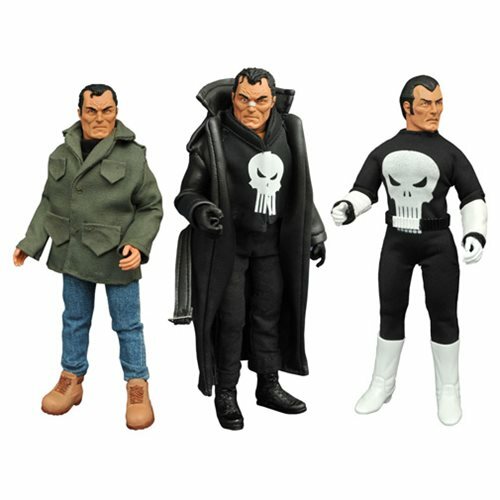 Designed and sculpted by EMCE Toys, this special Punisher 8-Inch Retro Action Figure Set features one classically styled, white-gloved Punisher figure in a vintage-style box, plus two additional heads and outfits: a bandaged head with trench coat and bulletproof vest, and the civilian streetwear of veteran Frank Castle. With interchangeable heads, hands, costumes, and accessories, you can display your Punisher however you want! Packaged in a full-color gift tray. Ages 15 and up.